"The entire Jewel Quest Solitaire series is so much fun. Each new game is another challenge therefore thoroughly addictive. I love the idea of combining solitaire with a match 3 game!" Embark on a tripeaks solitaire adventure filled with riches and mystery. Match card suits to earn pieces for the jewel board and then turn the board's spaces to gold. Unearth buried cards, avoid cursed jewels, and solve the 114 card layouts on a South American jungle trek. Experience 684 possible card scenarios and an exciting story in this combination of solitaire and puzzle fun. I have been looking for this game for almost 6 years and couldn't find it anywhere. Then just dumb luck found it on here! I absolutely love this game. When I had it before I actually had the pleasure of finally making it all the way up through the levels and beat it and had a great time doing it! Now, I'm happily playing it again! Enjoy! If you like solitaire which I love, you will love this game! Very fun, the different ways the board is set up, great graphics, great everything! I love this game! I play it almost everyday! Great game. I can play it for hours and hours. I like this game. It gives me time to figure out the level without timing me out. I am handicapped and it can be difficult to play some games. It is addictive, but in a positive way! 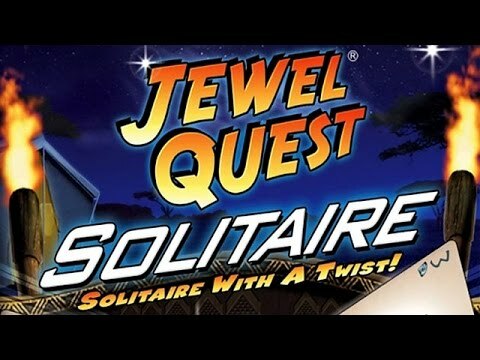 For the people that haven't played Jewel Quest Solitaire, give it a try. I'm sure you will be glad you did. I have been playing this game for a long time and still love it.